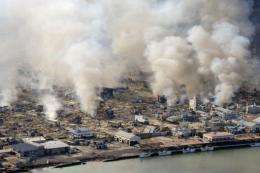 White smokes rises into the air in the badly damaged town of Yamada. Japan's recent massive earthquake, one of the largest ever recorded, appears to have moved the island by about eight feet (2.4 meters), the US Geological Survey said. Japan's recent massive earthquake, one of the largest ever recorded, appears to have moved the island by about eight feet (2.4 meters), the US Geological Survey said. The Pacific plate pushes under a far western wedge of the North America plate at the rate of about 3.3 inches (83 millimeters) per year, but a colossal earthquake can provide enough of a jolt to dramatically move the plates, with catastrophic consequences. "With an earthquake this large, you can get these huge ground shifts," Earle said. "On the actual fault you can get 20 meters (65 feet) of relative movement, on the two sides of the fault." I wonder how long it will take Pat Robertson to figure out a "reason" for God to hit Japan with this earthquake. I doubt it will be a "pact with the devil" like the Haitians, but he will probably think of something. Displacement is a vector quantity. In what direction was Japan moved 8 feet? primarily to the east (108 degrees) based on inverted slip model. I guess google has to update their maps..
Yeah, what a pain for them. Why, Pearl Harbor, of course.